Happy Pi(e) Day! I know you thought that, after a grueling National Pie Month in which all you lurking cake lovers were so over pie, you’d be back in the realm of sanity for a bit. But today is March 14. 3.14. The first three numbers of the mathematical constant Pi. And to celebrate this mathematical constant that I could not explain to you if I tried my hardest, we eat pie. Of course. Yesterday I attended a Pi(e) Day Observed party at my friend Rachel’s house where there were over a dozen pies in a variety of sweet and savory flavors. All delicious. This year for Pi(e) Day I decided to contribute a tart, which is, I believe you can argue, a subset of pie. And because the market has been bursting with blood oranges these past few weeks, I couldn’t resist the idea of a citrus tart. To form the base of my tart I made a blood orange curd. It was my first curd, and I was very nervous about it. A curd is a combination of eggs, citrus, butter, and sugar. It’s yogurt-like in consistency and can have a sweet or tart citrusy flavor. And when it serves as the middle layer between crisp crust and sweet fruit, it is perfection. 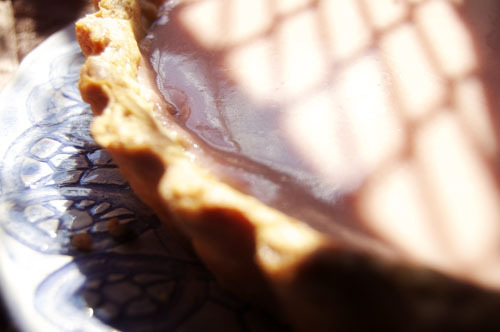 When it comes to tarts the crust is baked by itself, which means that the use of some sort of pie weight (whether they be ceramic or metal balls or beans) is necessary. Pie weights keep the pie crust from puffing up, allowing plenty of room for you to fill in with curds and layers of beautiful fruit. I topped my curd with a layer of sliced oranges. This was perfect at first but as soon as we got into the car to go to the party the movement of the car prompted the oranges to settle and get swallowed up by the curd. Which didn’t impact the flavor but did make it slightly less pretty. If I were to do it again I would do a secondary layer of oranges, I think. Overall this tart was perfectly tart and very delicious. It was a great way to celebrate Pi. Finally, I wanted to share an anecdote. One of the questions I get fairly regularly that is not on the FAQ page (but maybe should be) and one of the questions that Live Richly asked but that didn’t make it into the Q&A is how I came up with the name of the blog. The honest answer is that I don’t remember. I remember coming up with a handful of names and running them by my BFF Megan. She picked the one she like the most, which was Biscuits and Such. Which, for the record, is the way I make 90% of my choices. I don’t buy clothes without texting her a picture from the dressing room first. I don’t submit interview answers without her seeing them first. When I write these blog posts, I write them as though I am talking to her. Which is (I hope) why people say that reading b&s is like talking to a good friend. So I wanted to take a moment and shoutout to my homegirl, my best friend for so many years. She’s the only person I’d ever wear leopard print for. The night before you want to make your tart, begin making your curd. 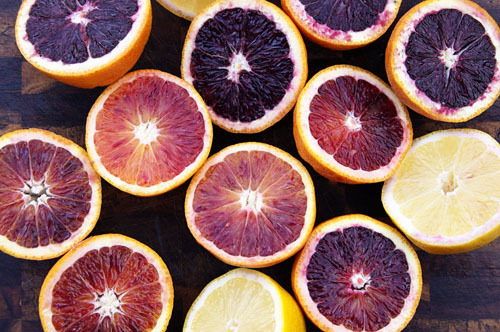 Squeeze approximately 6 blood oranges and 2 lemons (1 1/2 cups total liquid) and strain. Cube the butter. Over low heat combine the juice, sugar, and eggs. Stir constantly, adding the butter a few cubes at a time and allowing to melt before adding more. Do not boil. Stir until the curd thickens. Strain again and chill. 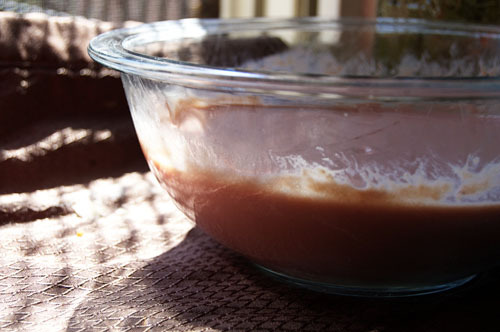 To make your crust combine flour, sugar, salt, and ginger in a medium sized bowl. Use your hands to work in vegetable shortening. Cube the butter and work that in with your fingers as well. Stir in extract and water, a little at a time, until the dough forms a ball. Wrap in plastic wrap and chill for one hour. Roll the dough out on a floured surface until it’s 1/4″ thick. 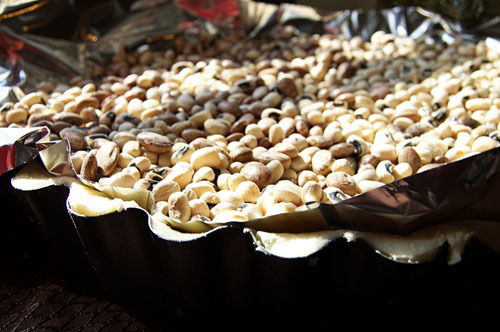 Press into tart pan. Cover with parchment paper (I used foil because I didn’t know better, parchment is superior in this instance because it allows the pie to breathe. Lesson learned) and fill with beans or rice. Bake at 400 for 25-30 minutes or until golden brown. Let cool. Peel and segment your oranges. Remove all excess peel and pith, cutting as necessary. Slice each segment in half. 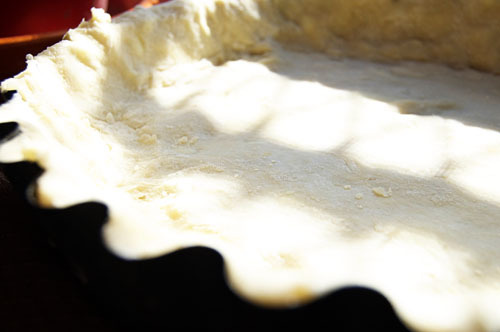 Remove the pie crust from the tart pan and fill with curd. 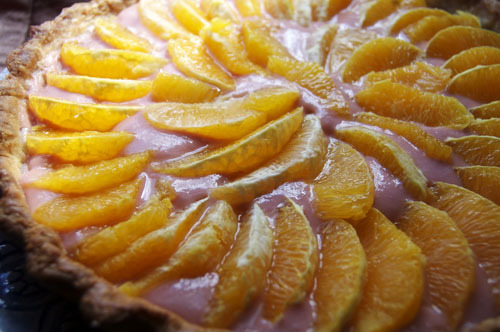 In a circular pattern gently place two layers of oranges into the pie. Chill for 1 hour. Serve. 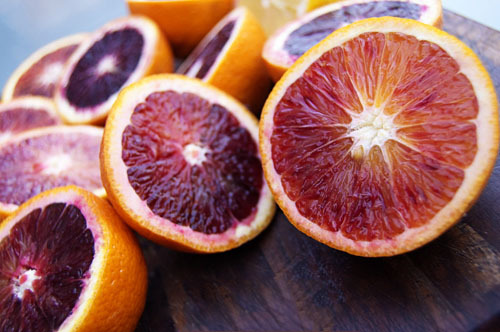 Blood oranges are so beautiful! I keep meaning to try one, but never seem to buy any. Wow, this looks fantastic. 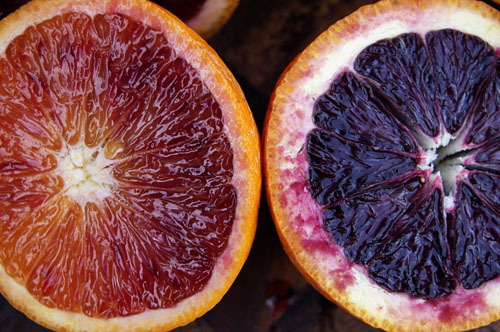 I’ve been buying a lot of blood oranges lately and I’m having fun making things with them (and photographing them!). The blood orange curd sounds delicious. Thanks for your sweet words, guys!